Austria's Foreign Minister Karin Kneissl -- widely criticised over a wedding invitation and dance with Russian President Vladmir Putin -- said Friday that diplomacy went beyond "exchanging policy notes". Kneissl said she had spent an "inspiring evening" on Thursday dancing samba and bossa nova with her British, Greece, Polish and Romanian counterparts on the sidelines of a an EU foreign ministers' meeting. She described Jeremy Hunt as "an excellent dancer and charming gentleman" when asked about the British foreign secretary's skills on the dance floor. "Diplomacy is about much more than presenting each other with policy notes... A dance doesn't have any political implications, whether I dance with Jeremy or anyone else," she said at a press conference. "I have danced with so many men before," Kneissl added before being interrupted by EU foreign policy chief Federica Mogherini. "I would stop here," Mogherini laughed. 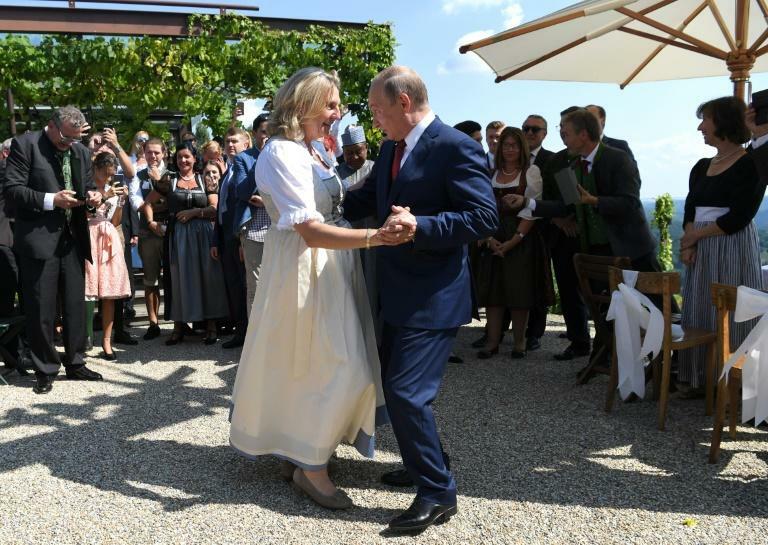 Photos of Kneissl dancing with Putin at her August wedding have fuelled questions about her neutrality and come amid reports that European intelligence services have distanced themselves from Vienna. Both Kneissl and Putin have insisted the wedding was a private event. Kneissl has told Austrian media that the two have built a "basis of trust". Kneissl was nominated to the post by the far-right Freedom Party (FPOe), which took power in a coalition government late last year. The FPOe has had a "cooperation pact" with Putin's United Russia party since 2016. Austrian Chancellor Sebastian Kurz, who is not in the FPOe, has insisted his country, which currently holds the rotating EU presidency, shares the bloc's stance on Russia, which has been sanctioned over its role in the Ukraine conflict.